The Institute publishes legal thinking and research in a variety of forms to meet the needs of its members and the wider legal community. the International and Comparative Law Quarterly (ICLQ). published price of all BIICL books and free access to the ICLQ. For any queries relating to the Institute's publications,please contact Patricia Ambrose, BIICL Deputy Director. Booksellers, distributors and libraries please contact our Finance Department for discount arrangements. 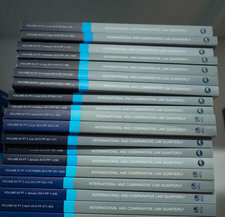 "International law books - BIICL for legal training and events"